Tears were flowing as our plane took off from our home in Washington DC to embark on our new journey in California. As much as we love Los Angeles, we also couldn’t help tearing up the next morning when we caught a glimpse of the Capitol building on the news. Washington DC is inspirational. It is a city filled with intelligence and passion. Washington DC has made us stronger, and taught us what it means to work hard for what you believe in. After two years of learning from some of the best educators in country at Georgetown and KIPP DC: AIM Academy, we are taking what we have learned and bringing it back to California. Brent will be putting his MBA to use at McMaster-Carr, and I’ll be teaching 5th grade at KIPP in South LA. Mama raised us to never throw away food, so in the weeks before our move I started cooking unusual combinations of food to make sure everything got used. 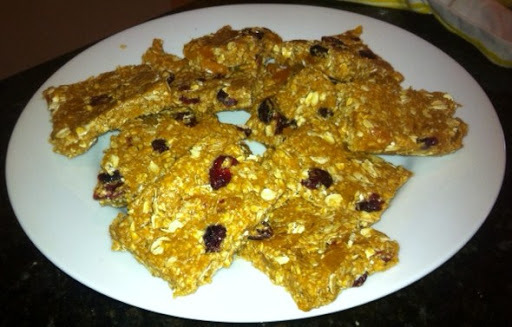 While Marta was visiting DC we decided to use the last of our baking supplies to make energy bars. We just started throwing energy bar ingredients into the kitchenaid and hoped for the best. The result was quite delicious, required no cooking and was perfect to have on hand while packing. It has now been over a week since I’ve had all my kitchen supplies, and I am so eager to cook! The moving truck arrives in LA tomorrow, so I’ll be energized and ready to cook and blog West Coast inspired meals. 1. Line a 9×9 square baking pan with wax paper, leaving a 2 inch overhang on 2 opposites sides. Set aside. 3. Last, mix in the dried fruit. 4. Pour the mixture to prepared baking pan, spreading it evenly to the sides. 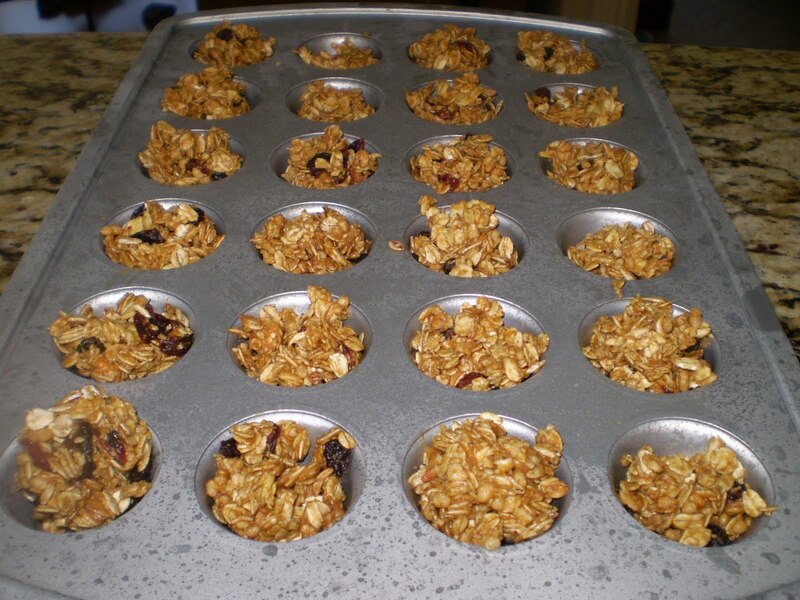 To make energy bites, divide mixture in a mini muffin tin. Press down firmly to compact the granola. 5. Chill in the refrigerator until firm, at least 2 hours, up to overnight. 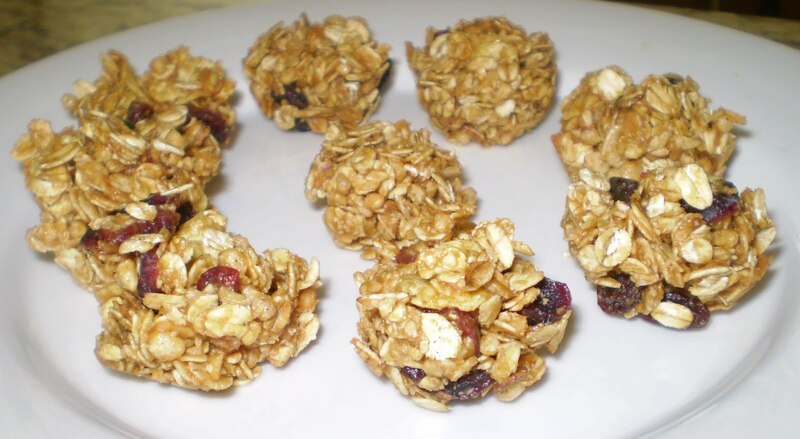 When firm, using the wax paper overhang, lift granola out of pan and place on a cutting board. With a large, sharp knife, cut into bars. This entry was posted in Breakfast Foods. Bookmark the permalink. these are so easy to make and you can modify pretty easily! so good! i love bars in general.